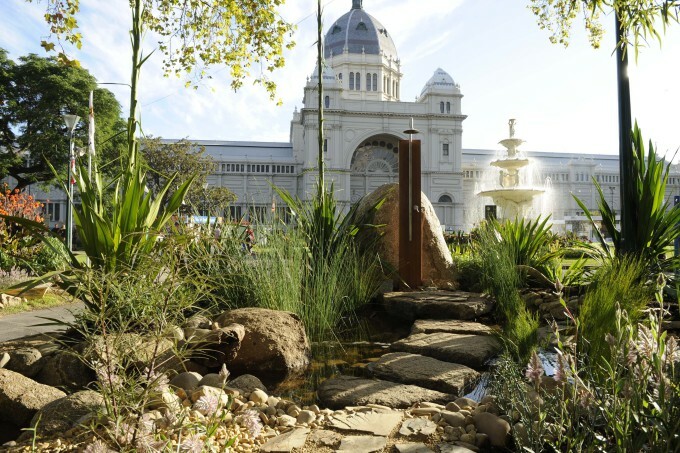 Each year the horticultural industry travels to Mecca (oops I mean Melbourne) to cast judgement and critique what many of us affectionately call “MIFGS” (a much-needed albeit rather undignified acronym of The Melbourne International Flower and Garden Show). It’s a role I find slightly disturbing, I mean as a born-optimist, I always see the bright side to everything – I’ve never designed a MIFGS show garden – so who I am to cast nasturtiums? 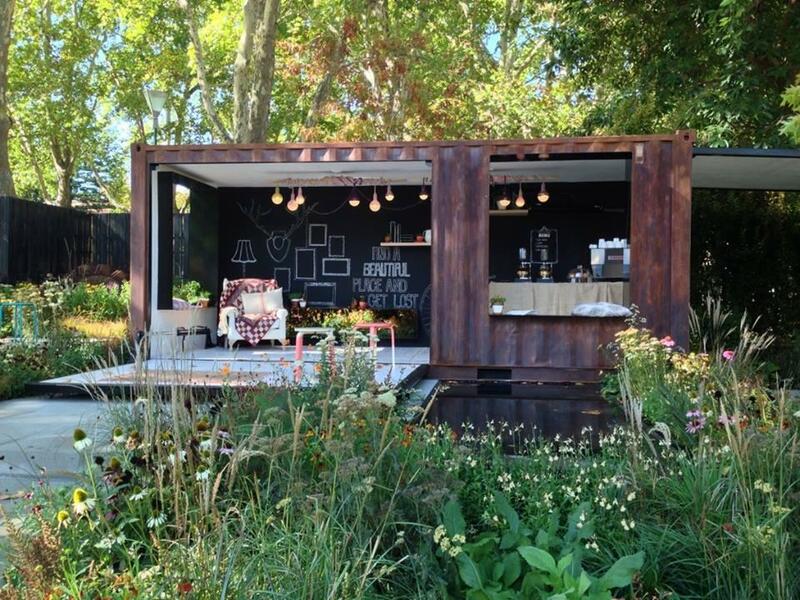 Putting on a ‘show garden’ is a project of serious proportions. It takes years of planning and multiple sponsors (read bwt lines ‘a HUGE budget’) to even put pen to paper. They have to find plants to do their thing on cue, whack it all together in lightning speed and coordinate teams of builders and trades-persons on site at Carlton Gardens mid-city Melbourne. Then sit back and cop the criticism. Then weep while it’s dismantled, gone forever. Sound like fun? I’d prefer to see my garden grow at a snails pace thanks very much. Ross Garden travellers, like me, simply buzz through a MIFGS day, getting more and more excited until we reach fever-pitch at the floral pavilion, enjoying the spectacle and always finding something fab to rave about. Ross Tour Leaders were asked about their favourite Melbourne show-moments. Here is what they said. Sandra Ross said… “It was late when I eventually was able to leave our stand and get to explore. (I tagged along with a party of landscapers and grabbed a champagne from the tray). The park was tinged with gold in the late afternoon light … a bit like walking into a Heysen painting. 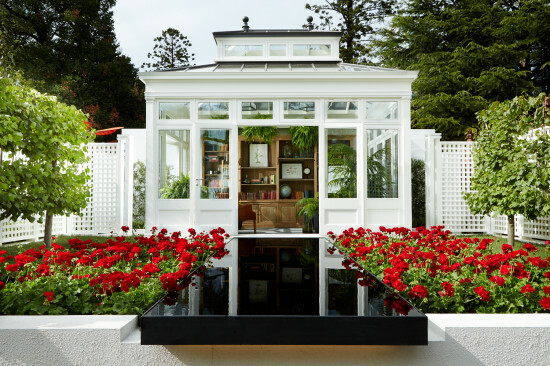 Then I saw it… a classic white painted conservatory fitted out as a library and filled with ferns and books and botanical paintings. Enclosed with a white double trellised fence and surrounded by a woodland of bright red lipstick maples, it was straight out of Brideshead. Yes every book reader, man, woman and child, wept with desire. Who wouldn’t want a library in their garden? Martin Semken found this classic Edwardian library on the internet (ebay?). The UK company, Hampton Conservatories, was struggling to keep afloat in these tough times. But they recognised the opportunity and agreed to build it and ship it flat-packed-IKEA-style, to Australia. But the timing was tight; it arrived with barely 6 weeks to set the whole scheme together; fit it out, install trellises, the canal and of course the garden. The son of the Hampton Conservatories’ owners happened to be backpacking around Australia and he came to Melbourne to help with assembly. Newspaper coverage here and in Britain ensured the success of the venture and three have been sold so far. One sold at auction for $100,000. Carolyn Dwyer said… “The sparkling fountain and smiles said it all when Ross Tour group arrived at Melbourne Flower Show on a spectacular autumn morning. First stop was the Ross Garden Tours balcony room where Sandra was busily sweeping out the leaves. We had our list of ‘must sees’ and headed for the show gardens in their cool Carlton Gardens setting. We all loved Paul Bangay’s restrained palette with rows of superior Magnolia ‘Teddy Bear’ at the boundary, posh mop heads of PG Hydrangeas, trademark spheres of box, hints of blue Salvia with that classic brick floor.His use of vertigris copper in the water feature and shelter gave a timeless feel. Paul Bangay is one of Australia’s highest profile landscape designers. His spare time is spent at Stonefield, his enormous country estate (well worth a visit if you get the chance – or check out his new book by the same name!). We love Paul’s awesome books, The Defined Garden, The Boxed Garden, The Balanced Garden and The Enchanted Garden. This was his first MIFGS garden called ‘Tension’. Yes it was defined, boxed, balanced and enchanting…. the only thing that seemed tense were those micro-pruned Buxus balls! 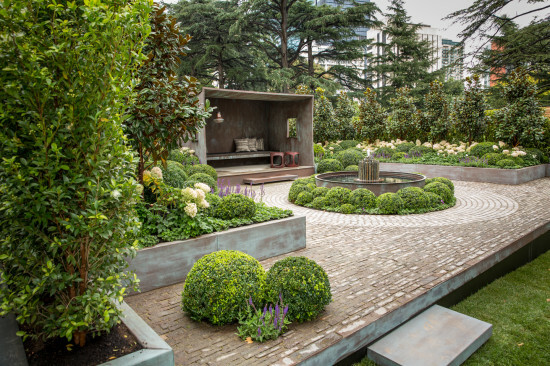 The Best in Show Award went to The Patriarch’s Garden, dedicated to a much loved father (of Mark Browning), was the overall winner and well deserved. 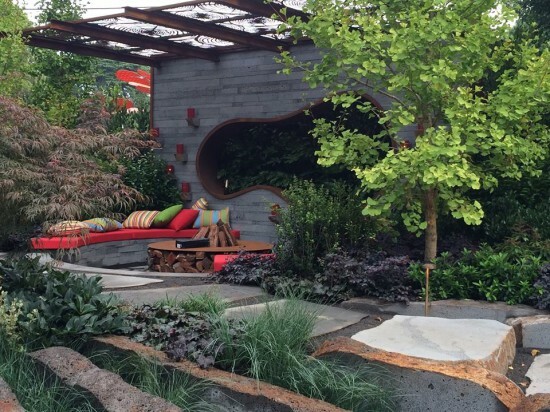 The philosophy behind the design used massive slabs of rocks to symbolise two siblings and their extended families and the lime green of Ginkgo and maroon tinged Acer serrata ‘Crimson Wave’ added height. The Patriarch’s Garden was designed by Cycas Landscape Design. 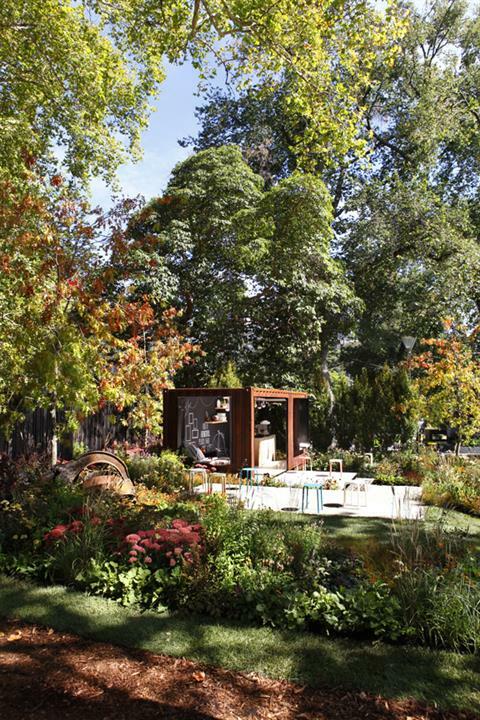 Linda Ross said… “The autumn sun shone on this garden. I love that feeling when the hint of autumn in the trees above match so well with the garden tones below, a kinda warm being-at-one-with-the-universe mood sets in. 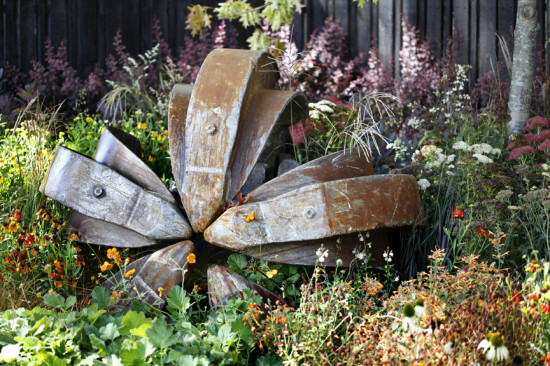 The silver medal garden ‘Left-Overs’, designed by Ian Barker Gardens, spoke to the romantics. Filled with musty pink autumn flowering perennials, it was dreamy. 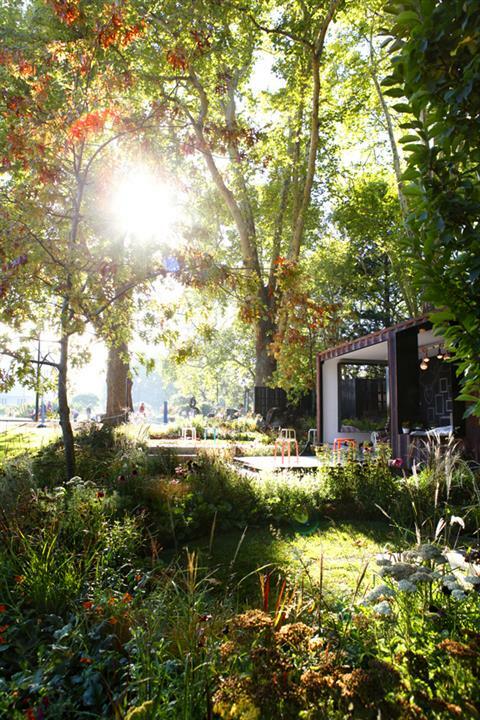 The garden fit under the treescape of Carlton gardens perfectly. What about that heavenly light streaming though the canopy making the garden glow? Big trees make such a difference …don’t they? 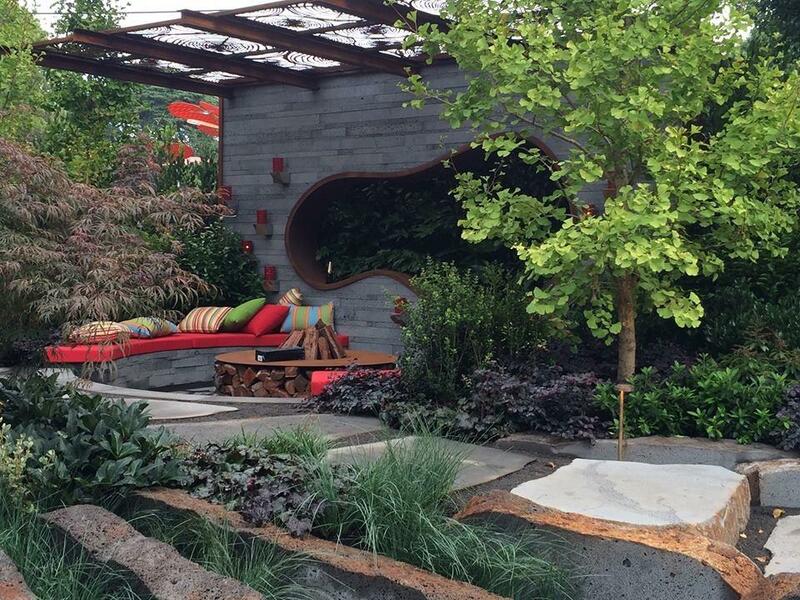 Congratulations to all who participated in MIFGS 2014 – once again it provided a much-needed shot in the arm for horticulture and garden design in this country, and a deep appreciation of just how beautiful nature really is. Next postcard we’ll check our favourite flowers, some of which were new to MIFGS and some which made us look twice. So what do you think? Are you reaching for next year’s diary. I know I am. 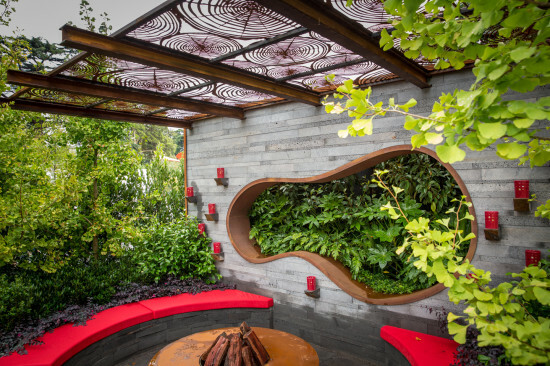 Photos: Philip Shaw (library), Ian Barker Gardens. 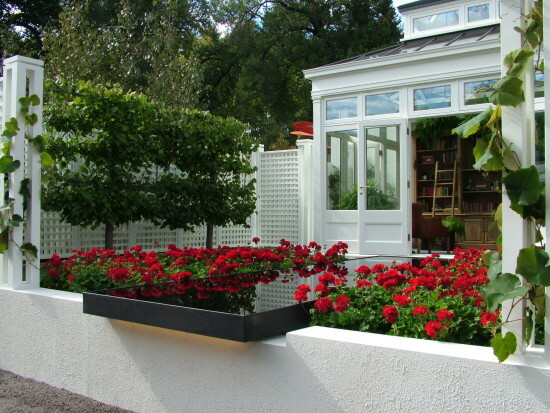 Linda Ross is a tour leader for Ross Garden Tours, the Managing Editor of Garden Clinic Journal, and gives garden advice with The Garden Clinic Club.